It is a common misperception that sympathy, empathy, and compassion express the same thing. However, there are important distinctions – ones that can have negative implications for others and well as for yourself. Below is a breakdown of those differences and implications. SYMPATHY: Feeling “sorry” for another’s pain/hurt. 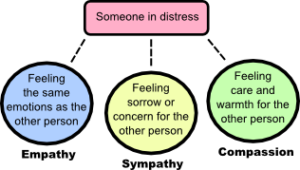 Sympathy is marked by having emotional distance from the sufferer – one is not experiencing the pain for themselves and are not trying to consider the pain from the sufferer’s perspective. Feeling sorry for another can quickly slip into pity. Pity is never helpful: it does not offer understanding or validation of another’s experience. Instead, it can feel belittling, judgmental, and dehumanizing. EMPATHY: Imagining yourself in another’s shoes. One is feeling empathy when they can connect with our shared common humanity – the recognition that we ALL feel loss, grief, exclusion, betrayal and a host of other painful emotions. As a practitioner, I cannot profess to understand all the nuances of another’s painful experience, but I can certainly tap into my own experiences that produced the emotions my clients are currently contending with (such as exclusion, betrayal, loss, shame, et cetera). Interestingly, on a neurobiological and somatic level, our own body will experience the same emotions we are attuning in the other. Empathy attunement is not for the faint of heart – it requires a tremendous amount of self-care to maintain optimal psycho-hygiene. 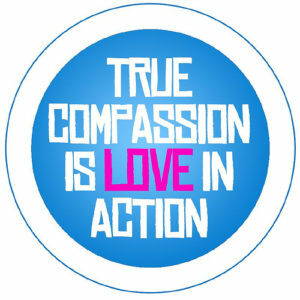 COMPASSION: Compassion is considered love in action (isn’t that beautiful?). Compassion is the ability to understand and connect with another’s pain, but then put it into effective action. I think of compassion as the act of purposeful and empathic generosity. Studies show that the act of generosity (the quality of being kind and understanding, the willingness to give others’ things that have value) does not just benefit the receiver of our compassion, it also boosts our own physical and mental health as well as self-confidence, self-awareness, and self-kindness. Generosity reduces stress, depression, self-centeredness, and negative self-talk, boost’s physical well-being (by decreasing stress ailments such as stomach aches, chest pains, headaches), enhances meaning and purpose, as well as strengthening connection to others and Self. Generosity and connection to others is evidenced to increase longevity. Whereas empathy has been shown to mirror the emotions of those suffering (thus potentially causing us fatigue), compassion is actually an energizing experience (cool, huh? 😎). To harness the power of compassion it is helpful to discern what is going on for you when you engage in supporting others. If supporting others constantly feels draining for you, that is a good indicator that you may be engaging in over-empathizing. How can you shift over-empathizing to compassion? The practices of self-compassion, mindfulness, and Metta can help (see links for more on these practices).